Cloudless blue skies, crisp notes of autumn air and Mother Nature showing off with brilliantly bedecked trees beckon us outdoors in the fall. Where are the best places to experience this coveted season in the South? More than Georgia’s big city, the ATL shines a light on some sensational ways to soak up the essence of autumn outdoors. Take art outdoors with the High Museum’s piazza installation “Tiovivo: Whimsical Sculptures by Jaime Hayon” through November (1280 Peachtree Street N.E., Atlanta, GA 30309; www.High.org). Four large-scale wooden sculptures transform the space into an outdoor art gallery and playground where interaction and play are encouraged. The annual Butterfly Festival, August 20, is a family favorite in Dunwoody (5343 Roberts Drive, Dunwoody, GA 30338; www.DunwoodyNature.org). Two enormous tents are set up at the Dunwoody Nature Center and filled with gorgeous free-roaming butterflies for families to venture inside and explore, first receiving instructions to ensure the safety of the friendly insects. Marietta Chalktoberfest, October 8-9, (30 Atlanta Street, Marietta, GA 30060; www.Chalktoberfest.com). Chalktoberfest will feature over 100 different types of craft beers and the Marietta/Cobb Museum of Art has brought in approximately 50 sponsored, professional artists who will be painting the streets of Marietta. Enjoy your afternoon sampling craft beers, listening to live music from local artists, watching professional Chalk Artists chalk the streets and eating great food at the beautiful downtown square of Marietta. Dunwoody’s largest park, Brook Run Park (4770 North Peachtree Road, Dunwoody, GA 30338; www.CVBDunwoody.com/things-to-do/parks-and-recreation/) has been revitalized to feature a large children’s playground, a two-mile, multi-use loop trail, a skate park and dog park, a community garden and event pavilions. Take an afternoon walk/run or bike around the multi-use trail during August for some breathtaking views. There’s no better way to spend a brisk fall day than hiking the Chattahoochee River National Recreation-East Palisades Trail (1425 Indian Trail NW, Sandy Springs, GA 30327; www.NPS.gov/chat/index.htm). With its network of trails and breathtaking views of the Chattahoochee River, East Palisades is a natural oasis in the heart of metro Atlanta. Take a self-guided tour of the Douglas County Butterfly Trail (6754 Broad Street, Douglasville, GA 30134; www.VisitDouglasCountyGa.com), open year-round but especially spectacular in the fall. Did you know? Douglas County offers over 5,000 acres of recreational greenspace including Sweetwater Creek State Park, Boundary Waters Park/Aquatic Center, Pine Mountain Gold Museum Park, Dog River Reservoir Park, Clinton Nature Preserve and Foxhall Resort & Sporting Club. For outdoor recreation in the Metro Atlanta region, the choice is Naturally, Douglas County! Visit six public gardens in Douglas County, all registered with the Rosalyn Carter Butterfly Trail. Explore the outdoors with a visit to the Dunwoody Nature Center (5343 Roberts Drive, Dunwoody, GA 30338; www.DunwoodyNature.org). Ideal for families and children of all ages, visitors can walk the banks of Wildcat Creek, try their hand at geocaching, find adventure in a treehouse and real Native American teepee, and much more! Get outside and explore Kennesaw Mountain National Battlefield Park (900 Kennesaw Mountain Drive, Kennesaw, GA 30152; www.nps.gov/kemo/index.htm), one of the most visited national battlefield parks in the United States with over 20 miles of trails for all ages. Catch sight of more than 130 bird species and explore the tree-lined paths as you hear the sound of nature at the Newman Wetlands Center (2755 Freeman Road, Hampton, GA 30228; www.CCWA.us/newman-wetlands-center). Walk along the multiple paths throughout this 32-acre wetlands and wildlife habitat. There’s no better way to take a little taste of Dunwoody home with you than with the jams, jellies, and sauces of Emily G’s Jams of Love (www.EmilyGs.com), all handmade using fresh, locally grown ingredients. These delicious jams are available at D’Vine Wine Bar & Shop, select grocery stores, and online at her official website. www.MariettasquareFarmersMarket.com/). Bring a taste of Marietta home with you at the Marietta Square Farmers Market. Sixty plus vendors featuring homegrown vegetables, fresh flowers, local honey and much more. Opening late summer 2016, the Fernbank Museum of Natural History is expanding to the great outdoors with an all-new outdoor experience, WildWoods at Fernbank Museum of Natural History (767 Clifton Road N.E. Atlanta, GA 30307; www.FernbankMuseum.org/explore/wildwoods/). The exhibit will feature elevated walkways, interactive exhibitions, incredible vistas, a wildlife sanctuary, a connector path to Fernbank Forest and immersive nature experiences. Release your inner daredevil at Alpharetta’s Motorcycle Safety Foundation (1450 Morrison Parkway, Alpharetta, GA; www.AwesomeAlpharetta.com/what_to_do/motorcycle-safety-foundation/) during one of the internationally recognized rider training classes dedicated to expanding rider education and motorcycle safety. You’ll find bikers taking basic training classes, youngsters learning to maneuver ATV’s, groups working on team building or a family learning the elements of dirt bike riding. Take it to new heights–heights up to 55 feet above the ground! With zip-lines stretching more than 200 feet, Treetop Quest at Brook Run Park (4770 North Peachtree Road, Dunwoody, GA 30338; www.treetopquest.com/dunwoody) boasts ample adrenaline spikes for the thrill seekers, with specialized preliminary training and experienced guides to reassure the most apprehensive. As one of the most exciting, family-friendly adventure courses in Georgia, Treetop Quest is touted as a new genre of educational, adventurous and environmentally responsible recreation. During the fall season, September 17-November 6, test your skills with a tour through a corn maze before joining in more fun at the pumpkin patch, peddle carts, a jumping pillow, a corn cannon and more family-friendly fall activities at Southern Belle Farm (1658 Turner Church Road, McDonough, GA 30252; www.SouthernBelleFarm.com). The highlight of a trip to Southern Belle in the fall though, is seeing their racing and swimming pigs. 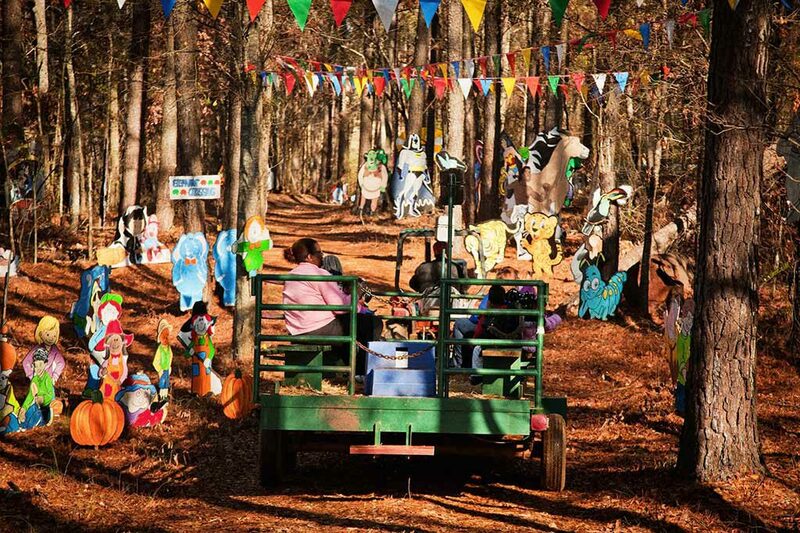 Save the date: October 1-31, find the perfect pumpkin, take a hayride through the cartoon forest or visit the farm animals with the family at Yule Forest Hwy 155 (3565 Highway 155 North, Stockbridge, GA 30281; www.AboutYule.com). Older teens and adults who like to be spooked won’t want to miss “Fear the Woods” which includes a haunted hayride and trail and a zombie paintball hayride.